- Your post must be published between 00:00 GMT Tuesday May 10, 2011, and 00:00 GMT Wednesday May 11, 2011. 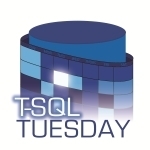 - Your post must contain the T-SQL Tuesday logo (see above) and the image must link back to this blog post. - Trackbacks should work, but if not please put a link to your post in the comments section so everyone can see your contribution! - Include “T-SQL Tuesday #18″ in your blog post’s title. - Mention “coefficient of thermal expansion” in your post. - Tweet about your post and include the #tsql2sday hashtag. - Contact Adam Machanic and tell him you’d like to host! T-SQL Tuesday #025: Trick or …? SQL Saturday #119 Open for Registration!